The above map is a snapshot of design 'work in progress' issued by HS2 Ltd in June 2017. The area to the right of Lower Thorpe viaduct crossing Banbury Lane is an embankment leading to a cutting before the proposed Greatworth tunnel. The first map below, issued with the above map, details the entrance to Greatworth Tunnel. with the realigned Banbury Road on the left. The map below, also issued with the Environmental Statement, depicts contours of AVERAGE noise. 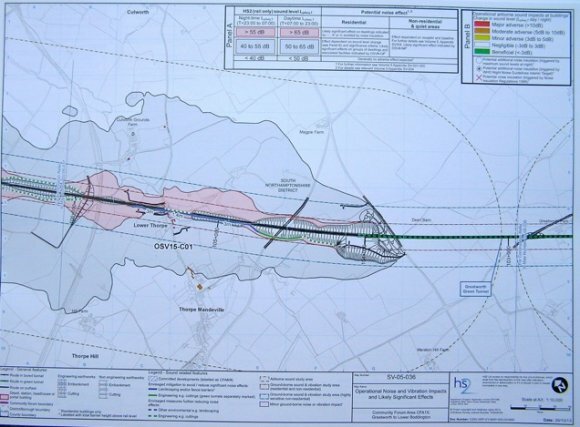 HS2 have released maximum noise figures but no related contour map! If a peak noise map had been produced the grey area (50-65db), barely touching the village in the map below, would probably envelop most of the village. 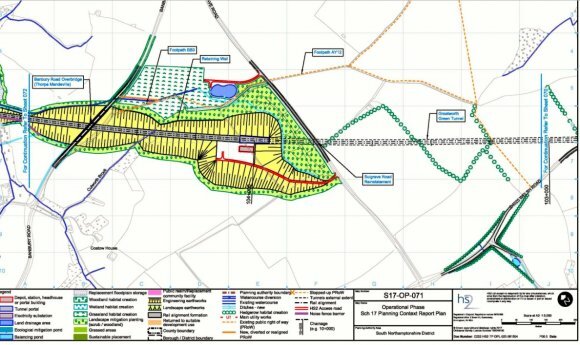 The previous page of this website provides an overview of HS2 in the parish.